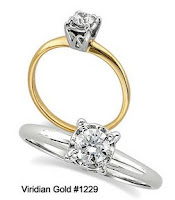 We strive to make it as easy as possible for you to determine the size of the ring which you order from Viridian Gold. We use standard ring size dimensions that are commonly used in the United States, so you can be assured of a compatible sizing system even if you have your ring finger measured at a local jeweler, or if you already know your ring size. But remember, the ring size of the same finger on your left and right hands will almost certainly be different--usually the dominant hand is a little larger in ring size. So, how can you find your ring size? One way is to download our Viridian Gold Ring Sizing Guide from our website--it is a PDF document, and you should print it as actual size (do not "shrink to fit") on regular 8.5" X 11" paper. It will give you tips on how and when to figure out your ring size, or the ring size of a loved one. You will also find a chart of circles which correspond to common ring sizes, so you can place an existing ring on the paper and get a pretty close approximation of its size. Or, you can cut a paper strip to determine the circumference of your ring finger, and then place that strip on a sequence of bars on the page to find the equivalent ring size. 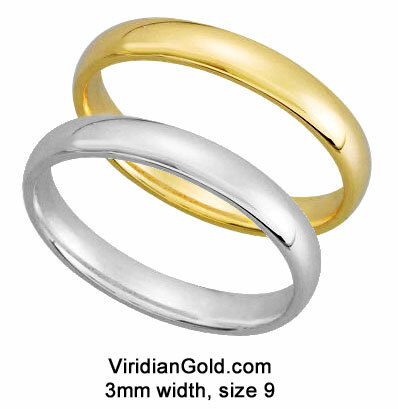 The most accurate way, though, is to order our $2.00 Ring Size Kit from our website at http://www.viridiangold.com/ring-size-page.html. We will ship this to you at our expense, and you should receive it a couple of days after ordering because it will come first class mail (US destinations only). Of course, our normal $50 minimum order amount does not apply! You will receive a plastic card with dummy plastic rings in 1/2 sizes from 2 to 14--just break out the ones that are close to your size and try 'em on! They are 4 mm wide, so they are a good approximation for most ring widths. Of course, you can also drop by any local jeweler to have them help you determine your ring size. Many of our customers also patronize their local jewelers, and we certainly support that practice! Speaking of ring widths, on our Ring Size Page, you will also find a helpful visual aid which allows you to see various common widths of rings on a person's hand. 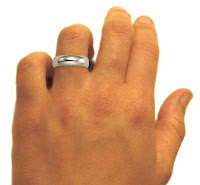 We show simple wedding bands, but you can use your imagination for other ring styles! You can find the width of the ring you are considering purchasing from us in the specifications at the bottom of the ring's page on our website.